2010 is among us, and it's time to make cakes! The Christmas season of Cake Balls went extremely well, so now the baking begins for birthdays, showers, and other parties. 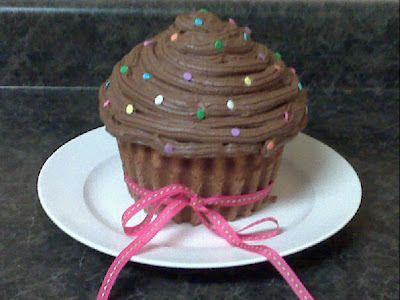 I started with the giant cupcake. I was so excited to make this cake, I didn't care if it was eaten, I just wanted to make it! It turned out adorable and tastes good too! It is the perfect cake for a birthday, the cupcake lover, or anyone who just loves cake! That cupcake looks delectible and delicious!